India’s benchmark indices Sensex and Nifty rallied on Friday to end at a record close as better-than-expected results from index heavyweights triggered strong buying by investors. The Sensex jumped 325 points to end at an all-time closing high of 37,336.85, while the 50-share Nifty spurted 111 points to 11,278.85. The market breadth was positive as 1,674 shares advanced, against a decline of 951 shares, while 165 shares were unchanged. Gains on the Sensex were led by ITC Ltd (5.2%), Tata Motors Ltd (3.5%), Tata Steel Ltd (2.7%), among others. Power Grid Ltd (1.7%) and Adani Ports & SEZ Ltd (1.44%) were the index laggards. ITC Ltd, the paper to cigarettes conglomerate, had reported good results for the first quarter of FY19 on Thursday. The company’s revenue (net of excise duty) grew 7.6% yoy to Rs10,707cr, in-line with the estimates. EBITDA grew 12.2% yoy to Rs4,202.1cr with an EBITDA margin of 39.2%, an improvement of 161bps yoy. Its PAT grew 10.1% yoy to Rs2,818.7cr, in-line with the consensus estimates of Rs2,815.9cr. On a comparable basis, gross sales (net of rebates/discounts) for the quarter grew 13.5% yoy driven mainly by the Agribusiness, FMCG-Others, and FMCG-Cigarettes segments. Buying interest in the stock was so strong that ITC dethroned Hindustan Unilever Ltd (HUL) as the most valuable FMCG stock. Among the sectoral indices, the Nifty FMCG index was the biggest gainer, rising 2.37% to 30,749.35 led by a surge in ITC Ltd (5.2%) and Godrej Industries Ltd (4.37%). 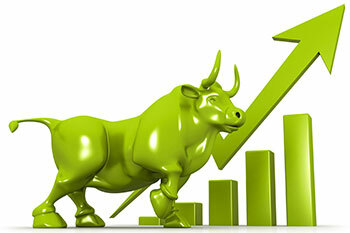 The Nifty Metal index was the second-biggest sectoral gainer, registering gains of 1.93% to 3,297. The jump was led by gains in Hindustan Copper Ltd (4.55%), Jindal Steel & Power Ltd (3.4%), and Hindalco Industries Ltd (3.5%), among others. Among individual stocks, Hindalco soared over 4.5% after the company announced that it would be acquiring US-based Aleris via its US subsidiary Novelis at an enterprise value of $2.58bn. The announcement was made post market hours on Thursday. Meanwhile, the rupee closed unchanged compared to the previous close of Rs68.66/$1. The domestic currency opened at Rs68.62/$1, up 0.04 paise against Thursday’s close.